The heartshaped Istria is first choice for many guests who decide to vacation in Croatia. The seductive mix of history, entertainment, excellent food, untouched nature and mediterranean and continental climate make Istria unique. This time we've made a seven day plan of a stay in Istria – which cities you can visit and how to spend some quality time there. Book an apartment or a room from our Istria offer and prepare yourself for a unforgettable experience. Start your Istrian adventure with a visit to Umag – the westernmost Croatian city and the center of northwest Istria. 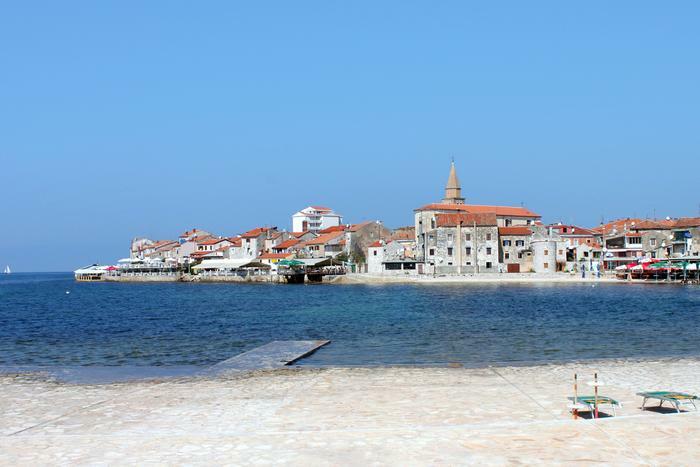 History buffs will love Umag, especially its old town centre. The old town still has remains of noblemen's houses from antiquity and rennaissance. Make sure to visit the city walls that date from the 10th century, the Museum of Umag that keeps various artefacts from the Roman age that are a witness to the everyday existence of its ancient inhabitants. The oldest Croatian lighthouse is situated in Savudria, a little town, just 9 km away from Umag. Built in 1818, it is the stuff of legend. Allegedly it was built by the austrian count Metternich in honour of his forbidden love towards a local girl. The lighthouse is open for visitors so you can climb to the 36 meter high tower and take a snapshot of a sunset. If you ever wanted to live in a lighthouse, you can experience it if you book an accommodation in the Savudria lighthouse. If during summer months you wish to refresh yourself in the sea, take a drive out of Umag and explore nearby beaches and coves. We recommend the Laguna Stella Maris that is because of lots of content ideal for families with children. Also we recommend the Kanegra beach surrounded with lush pinetrees that give a big shade. If you visit Umag in the middle of July, make sure to visit Croatia Open Umag, the world famous tennis tournament that beside the best Croatian players, brings other world famous players. The vicinity of Umag is intersected with bike trails and lots of bike tournaments are held throughout the year, so if you're in Umag with your bike, make sure to explore the bike trails. 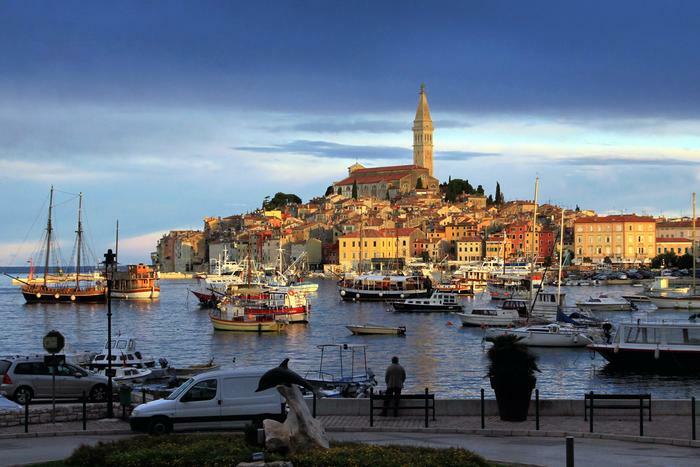 Rovinj, Poreč and Novigrad are little,romantic cities that will thrill you with their mediterranean atmosphere. Narrow stone streets, laid-back lifestyle and local sea food are just some of the reasons guests fall in love with these picture perfect towns. Once a fisher's village, now a popular tourist destination, Rovinj charmes with its colorful houses that along with the st. Euphemia church make a perfect postcard picture. Take a stroll through the stone – paved streets of Rovinj's old town, climb to the tower of st. Euphemia's church and soak in the magnificence of the view that lies ahead of you. As you take a break from all that sightseeing, sit in a caffe by the sea or refresh yourself in one of many restaurants, konobas or pizza places strewn across Rovinj. If you wish to stay longer in Rovinj, take a look at our offer of apartments and rooms. Explore bike trails of different lengths and difficulty level or visit the Valdaliso Diving centre in the Valdaliso camp where you can attend diving classes on different languages. Poreč is one of the most visited in Istria. In peak season the number of inhabitants can climb up to 100 000. So, everyone who is looking for an exciting vacation with lots of things to do, won't be dissapointed with Poreč. Partygoers will love the summer music festivals of Rise Up Poreč Music Festival and the Club MTV Europe Summerblast that bring to Poreč the biggest pop and electronic music stars. Throughout summer, from June to September, Poreč Open Air – Festival of life is taking place in Poreč's centre. The festivals is full of street performances, circuses, open-air movies and tribute bands concerts. But not all of Poreč is just about partying. The city is proud of its rich cultural heritage. Visit the Euphrasian Basilica, built in the 6th century A.D., unique because of its bizantine characteristics. Euphrasian Basilica's worth was recognized by the UNESCO in 1997 when it was made World Cultural Heritage. Beside the Basilica, while strolling through the centre take a look at the remains of Neptun's and the Big Temple, the roman forum of Marafor and medieval city walls that encircle the town. If you want to stay longer in Poreč, book an apartment or room from our offer. Unlike Poreč, Novigrad managed to keep its meditteranean atmosphere unsullied by mass tourism and that makes it ideal for all of those who are looking for a place to unwind. Still, being a tranquil little town, doesn't mean it's devoid of content, especially in summer. At the end of June or the beginning of July the Parkfest takes places in a couple of Novigrad's parks. For a taste of its local lifestyle, visit Novigrad in the middle of August when for three days, the local celebration of St. Pelagius - the city's patron saint takes place. Attend open air concerts, participate in local games or taste fish specialties. You can also participate in manifestations like The Night of Street Wizards (Večer uličnih čarobnjaka) – street performers showcasing their skills on the Big Square (Veliki trg) or the Astro Party Lunasa that takes place on August the 1st. On that day Kelts used to celebrate Lunasa – the first day of summer. All street light is out, photographs of planets and comets are projected onto the city's townbell, and one can buy an astrological souvenire or stargaze with a telescope. 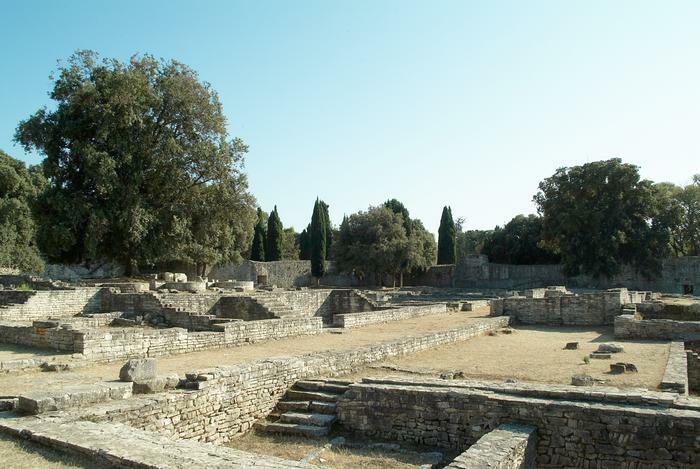 This 3 000 year old town is the largest in Istria and is most famous for its amphiteatre. 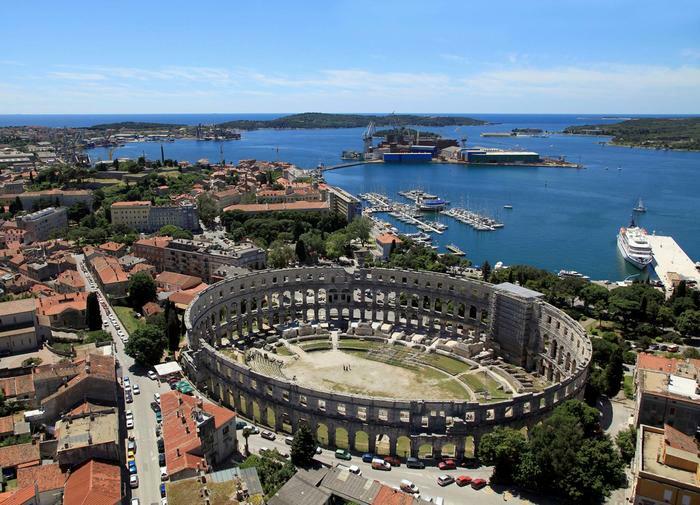 The most preserved monument of Roman architecture, the Pula Arena is still being used for big summer concerts of Croatian and world pop and rock stars. Beside this monumental amphiteatre, while strolling through the city's centre, you'll see other Roman monuments, like Hercules' gates, Two doors, the Augustus' temple and the Sergius Arch.All of these impressive monuments give Pula its unique antique charm. Both children and grownups will love the Pula Aquarium, 3 kilometers away from the city centre, on the austro-hungarian fort of Verudela in the Verudela cove. Not only can you see more than 200 species of different sea animals (from the ones inhabiting the Adriatic sea to the more exotic ones) and learn lots about them, make sure to visit the Centre for rehabilitation of sea turtles that is also in the Aquarium's building and whose personel take care of these vulnerable species. If you want to learn more about the sea and the sea world, sign up for numerous workshops the Centre organizes. After you've mingled with the sea animals, it's time for a refreshment down at the Hawaii beach not faraway from the center. Because of its long shoal, the beach is perfect for families with children. The beach Histria, awarded with the Blue flag, is also in the vicinity. Histria beach is nice for families with children because of its large shade and lots of content for the children. Book an apartment or room in Pula and discover the rich antique heritage of this city. Just 8 kilometers away from Pula, the magnificent Briuni islands, a group of 14 islands and islets is located. Back in 1983 it was made a National park, and before that it was the summer residence of the Jugoslavian president Tito. Board on a boat in Fažana and in just 15 minutes you'll be on Brijuni. The Briuni National Park has plenty of content to offer to all types of tourists. There's a Safari park where along with llamas, zebras, ostriches you can see an Indian elephant, given as a present to president Tito by India's prime minister Indira Gandhi. Briuni are interwoven with bike and walking trails that you can explore with a professional guide from October until May. Those who want to explore the National park on their own can walk or bike along the Trail of positive vibrations (Staza pozitivnih vibracija) while listening to the sounds of guitar and piano. Archeology buffs in shape can sign up for a 4 hour tour of historical monuments. From the bizantine castrum to St. German's church from the 15th century get to know the rich history of Briuni islands. Take a dip at Verige cove where was once a Roman villa, whose remains are still accessible for a visit. Getting bored by those pesky summer heats and crowds of tourists? 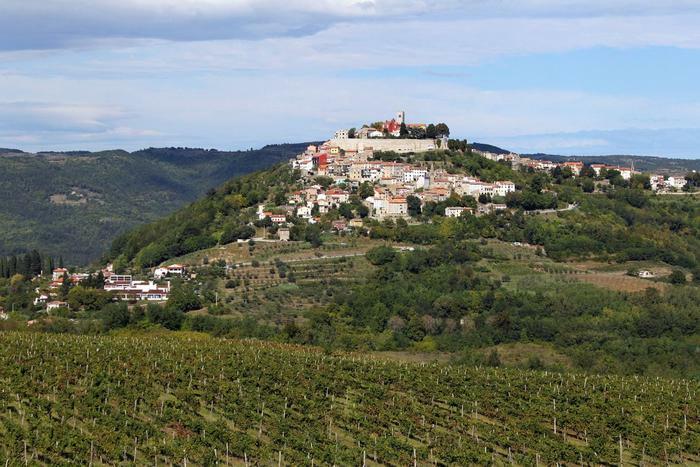 Istria invites you to its interior that will take your breath away with its green hills with medieval fortresses, little towns (the smallest town in the world – Hum – is in central Istria) and charming vineyards. Beside that, central Istria is heaven for gourmets – it's the place where the Momjan muškat is produced and truffels with a world reputation grow in its forests. Sport fans and adventurers should visit Pazin and its surroundings. Below the Pazin castle that dates back to the 10th century A.D. the Pazin cave (Pazinska jama) is located. There are 3 zip lines. Also, you can get to the cave's bottom and look around it with some help of a professional guide. Make sure to bring long sleeves because the temperature below is around 15 Celsius and sports footwear. The Pazin cave is open for visitors from May 1st to September 30th. Another cave open for visitors is the Baredina cave, 6 kilometers away from Poreč. If you want to sightsee the cave's interior prepare yourself for more than 200 steps. You'll need sportswear. The sightseeing lasts some 40 minutes. Before or after you sightsee the Baredina cave, peek into the little museum that has an exibition of different archeological arefacts and where you can find out some interesting facts from the history of speleology. After all that sighteeing it's time for a break. Just around the cave is a restaurant, a space for a picnic, while the youngest ones (and those who feel young) can visit the animal farm where they can see donkeys, ponies, turkeys, ducks and geese. Just 200 meters from the Baredina cave is an interesting exibition of twenty old tractors and agricultural machines (Tractor Story). The exibition was made to point out the importance these machines had at the beginning of the 20th century when most of inhabitants were living off their crops. Children too will find this exibition interesting. Even farther inland are the picturesque little towns of Motovun and Hum. Motovun became world famous for the Motovun film festival that takes place every summer and is a selecton of some of the best movies of recent world cinematography. With just around 500 inhabitants this town is located on a hilltop so prepare yourself for lots of hiking. If you're with a car, you can park on the free parking below the city or pay for parking just outside the entrance to the city. Beside the film festival, Motovun offers interesting content, especially for those prone to adventures. Those who decide to paraglide on the slopes of Motovun, are in for a lifetime experience. Those more willing for an adventure on ground can explore two walking trails (Motovun – Zamask; Zamask – Motovun) and three biking trails (Voćni put, Stara Ferata, Veli Jože) outside of Motovun. Your stay in Motovun won't be complete without a climb to the city walls and enjoying one of the most beautiful sunsets in Croatia. Set aside part of a day for a trip to Hum, the world's smallest city with just 21 inhabitants, two little streets and half a dozen houses. Being in Hum will completely return you to the middle ages when this little town was the centre of glagolitic culture. Stone monuments inscripted with the glagolitic alphabet can be found in the church of the Ascention of Mary and the town museum. Hum is also proud of its alcohol beverage – hum biska, made from white misletoe and four types of grass. 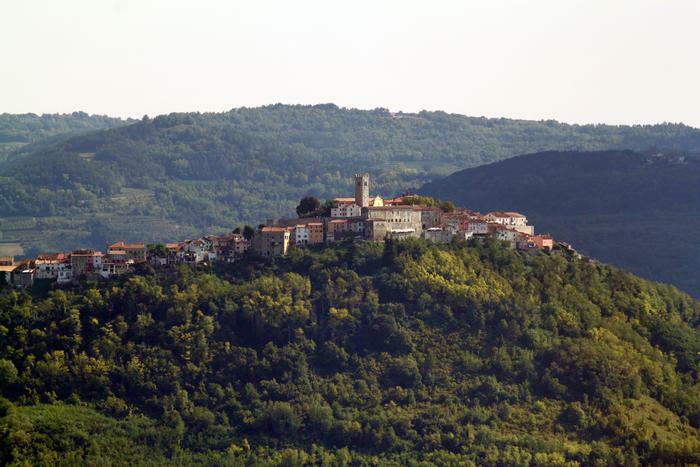 While you're in Hum you might as well visit Buzet, also a little town, known also as the town of truffles. If you're a fan of this specialty or you just finally want to try it, come to Buzet in September when Truffle Days festival takes place. Except for truffles, Buzet is known for its medieval fortresses.